Maybe Allah really wasn't on their side. 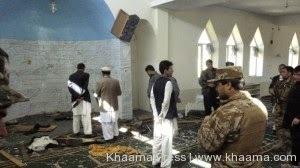 Taliban leader among 5 rebels killed in Ghazni mosque explosion A local Taliban commander was among five militants killed following an explosion inside a mosque in eastern Ghazni province of Afghanistan.Local government officials said the militants were killed while they were making an improvised explosive device (IED) to carry out a roadside bomb explosion. Deputy provincial governor Mohammad Ali Ahmadi said the incident took place on Saturday morning in western party of Ghazni city. Ahmadi further added that the Taliban commander was recognized as Mullah Sadiq who was killed along with four other militants following the explosion. Ahmadi further added that the Taliban commander was recognized as Mullah Sadiq who was killed along with four other militants following the explosion.